Head of the Jewish community of Schierstein in 1867. Head of the Jewish community of Schierstein starting in 1906. Based on the birth dates and places of their children, they moved from Schierstein to Wiesbaden in about 1862. - Adolph ROTHSCILD (30 March 1890, Wiesbaden - June 1942, Sobibor KZ) & Johanna BAUM (12 March 1893, Wiesbaden - June 1942, Sobibor KZ) Adolph and Johanna were deported from Wiesbaden on 10 June, 1942 to Lublin, and from there to the Sobibor death camp. - Alfred BAUM It is not certain that Max is the child of Mayer Baum or that Alfred is the child of Max. ‣ Ferdinand BAUM (27 June 1865, Wiesbaden - 14 October 1942, Theresienstadt) It is not certain that Ferdinand is the child of Mayer Baum. For the family of Johanne GERNSHEIMER, see THIS page. Seligmann Baum and his family moved from Schierstein to Wiesbaden in about 1867. On the occasion of his 80th birthday in 1916, he posed for a family portrait with his children, grandchildren, and great-grandchildren. The portrait is shown above. Siegried, together with his brother Moritz (below) started a children’s clothing store in the center of Wiesbaden, Gebrüder Baum (Brothers Baum). Siegfried was also a member of the Wiesbaden City Council and Board of Education. After the death of Moritz (1929) and Siegfried (1935), the store was run by his wife Emilie and daughter and son-in-law, Johanna and Albert Kleinstrass, until it was destroyed by the Nazis during Kristallnacht, on the night of November 10, 1938. More can be read about Emilie’s family on the BAER page, HERE. Moritz Baum, together with his brother, Siegfried, above, owned the children’s clothing store, Gebrüder Baum. His wife, Martha, left Germany in about 1935 for the U.S. She lived in New Jersey, and later in Los Angeles. When I was growing up in Los Angeles in the 1960’s, she was the oldest person I knew. Jakob and Bertha were first cousins (see Bertha, below). The family left Germany in the mid 1930’s. Daughter Liesel went to Paraguay, while Jakob and Bertha and daughter Gertrude went to Argentina. - Oscar Hermann MAYER (10 June 1907, Bruchsal - 17 October, 1993, Haifa, Israel) Went to Palestine, May 1938. Mathilde NEU lived with my grandparents (Albert and Johanne KLEINSTRASS) in Wiesbaden during the period before they were deported to Theresienstadt. Both her sons had left for Argentina early, in the late 1920’s and early 30’s. On a recent visit to Argentina I was able to find the family of her son Siegfried and meet them and I had a very nice afternoon with them. Gertrude was the second wife of Erich KORNBERG; his first wife was Irma BAUM, above. Much of the information on the Baum family comes from talking with Gertrude. ‣ Albert BAUM (8 August 1885, Wiesbaden - 1941, Chicago) & Paula SAMUEL (7 January 1890, Kerzenheim - 27 November 1970, Chicago) Albert was a butcher in Wiesbaden. in a POW camp in Australia. He never married, and returned to Germany after the war. their children are shown at right. See photo of party celebrating Lori’s birth at the bottom of this page. ‣ Leo BAUM (30 October 1893, Schierstein - 5 February 1941, Hadamar) Leo was hospitalized in the Eichberg Sanatorium in 1934. In 1941 he was murdered by the Nazis in their “T-4” program, a program of Euthanasia through gassing of people considered mentally defective. Many of the people who later ran the death camps for killing the Jews of Europe got their “training” in running the T-4 program. Joseph was head of the Jewish community of Schierstein in 1855. Founder of the Nassauische Leinenindistri, a large and important textile business. ‣ Joseph BAUM (5 September 1874, Wiesbaden - 25 March 1917, Mainz) & Alice/Liesel HAYMANN/HEYMANN (22 March 1876, Regensburg - 5 October 1942, Theresienstadt) Joseph Baum was called “Königlich Preußischen Kommerzienrat“. This is a title that was given until 1919 by the Prussian government to people who were very important and successful in business. After his death Alice remarried, to Dr. Nathan Nikolaus Hess. He died in 1939. Alice was deported to the ghetto of Theresienstadt in 1942 at the age of 66; she died after four weeks there. • Hermann BAUM (19 October 1850, Schierstein - 4 March 1914, Wiesbaden) & Julia Anna BLOCH (2 May 1859, Edenkoben - 14 July 1911, Wiesbaden) Julia was a well known concert pianist. 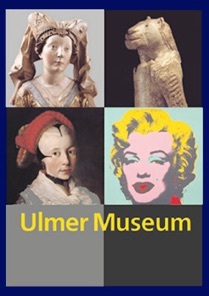 Prof. Dr. Julius Baum was a well known art historian and the first director of the Museum of Ulm (Ulmer Museum). Julius Baum lost his position in 1933 and was forced to emigrate to Switzerland in 1939. In 1945 he returned to Stuttgart and was the director of the Württembergisches Landesmuseum. ‣ Franz BAUM (14 January 1888 - 1982) & Abby BEVERIDGE (1910 - 1969) Abby was the daughter of U.S.
- Valor BAUM (stage name: Valora NOLAND)(1941 - ) Film and television actress in the 1960’s. Man from U.N.C.L.E. and Star Trek. 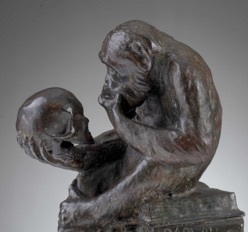 • Amalie BAUM (6 February 1855 - ) & Heinrich OPPENHEIMER For Heinrich’s family, see THIS page. descendants took the family name Liebmann. • Johanna LIEBMANN (9 August 1859 - 16 June 1942, San Francisco, CA) & Charles (Carl) BUYER (February 1838, Kasejovice, Bohemia - 1912, San Francisco, CA) The Buyers had a dry goods store on Haight Street. 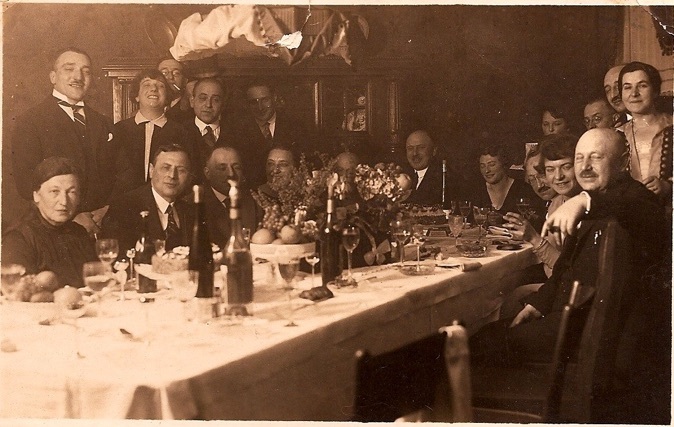 Party celebrating the birth of Lore Baum (daughter of Moritz BAUM and Betty BAUM (nee KATZENSTEIN), Wiesbaden 1931. If you are related to anyone on this page (or just want to say hello) I would very much like to hear from you. You can contact me at geneo (at) theKesters.net or click on the email link to the right. The Baum family of Wiesbaden, Germany, originally came from the small town of Schierstein. Schierstein is on the Rhein river, about 5 km (2-3 miles) from the center of Wiesbaden. Once an independent town, it is now part of Wiesbaden. Ancestors of the Baum family were living there at least as early as the early 1700’s. In 1853 there were 14 Jewish families living there. 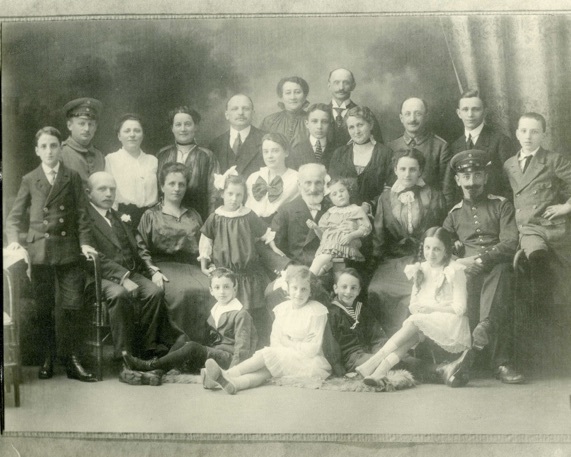 Several members of the Baum family or their descendants were listed as the leaders of the Jewish community of Schierstein, including Josef Baum in 1855, Abraham Kahn in 1867, and Daniel Kahn, starting in 1906. Abraham Wolf, who died in 1798, had two sons, Maier and Jacob. When Jews in Schierstein took family names around 1840, the children of Maier took the name Baum, while Jacob’s children took the name Liebmann. The two sons of Maier, Abraham and Joseph, both took the name Baum, and the two main branches of the Baum family in Wiesbaden are descended from them. They also had a sister, Sara, who married Daniel Kahn. The Kahn family of Schierstein and later of Wiesbaden are descended from them. Another sister married Hermann Herf and moved to the town of Partenheim. 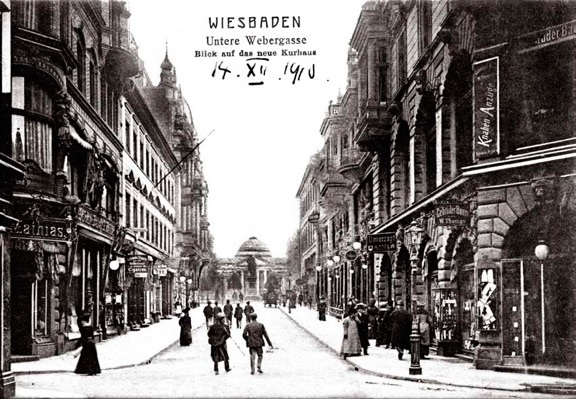 In the 1800’s as cities grew due to the industrial revolution (Wiesbaden grew from 2,200 inhabitants in 1800 to 86,000 in 1900) Jews also began moving from small towns and villages to the cities. This was true for the Baum family, who moved from Schierstein into Wiesbaden. The year that they moved can in some cases be determined by seeing where and when their children were born. For example Seligmann Baum’s family moved in 1867, between the birth of one child born in Schierstein in 1867, and the next, born in Wiesbaden in 1868. He and his family are shown on the right. In Wiesbaden several of the Baum families were butchers. Because of competition between these families, it led in some cases to a falling out among them, where different Baum families, although related, would have no contact with each other. The Baum family on the occasion of Seligmann Baum’s 80th birthday. 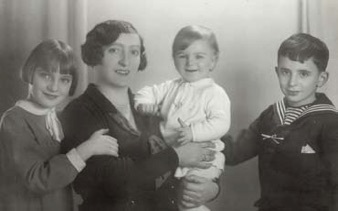 Betty BAUM (nee KATZENSTEIN) and her children, Trude, Lore, and Josef (Seppl) in about 1933. All were deported from Wiesbaden on May 23, 1942 and killed soon after. Two sons of Seligmann Baum, Moritz and Siegfried, opened a children’s clothing store called Gebrüder Baum. It was on one of the main shopping streets of Wiesbaden, among the most elegant stores and hotels of the city. The photo below shows the store in 1910. The store is on the corner on the right. The store was successful, and the brothers were among Wiesbaden’s more prominent citizens, with Siegfried being on the city council and the city school board. Moritz died in 1929, Siegfried in 1935. After that the store was run by Siegfried’s wife, Emilie, and his daughter and son-in-law (Johanna and Albert Kleinstrass). On the evening of November 9, 1938 the Nazi government organized riots against the Jews throughout Germany. In what became known as Kristallnacht (night of broken glass) or Reichspogromnacht, the SA and other Nazis and their supporters rampaged throughout Germany and Austria. Synagogues were burned, Jewish-owned shops had their windows smashed and their merchandise and furnishings destroyed. Most Jewish men of working age were arrested and sent to concentration camps. Many were killed. 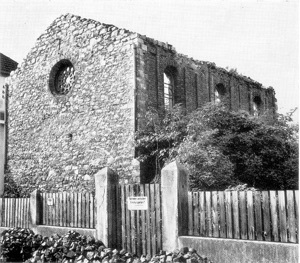 In Wiesbaden the synagogue was burned, as was the synagogue in Schierstein (see photo, left). The clothing store, Gebrüder Baum (photo below), had all of its windows and display cases destroyed, as did every other Jewish owned store. The Jewish men were arrested. When the arrests started, Albert Kleinstrass hid in the nearby forests. After five days, when it looked like the arrests had ended, he returned to Wiesbaden, but was arrested and sent to the concentration camp Dachau, where he was imprisoned until mid-December, 1938. There are memorial pages (in German) for several members of the Baum family, plus many other Wiesbaden residents, who were victims of the Nazis, HERE. In the list below, names in RED are people who were murdered during the Shoah (Holocaust), 1933-1945. The information on this page comes from many sources. They include: the recollections of my father, Paul Kester. The resources of the Aktives Museum Spiegelgasse, Wiesbaden’s Jewish museum and research center. Dorothee Lotmann-Kaeseler and Georg Schneider were especially helpful. Myrah Adams who researched Julius Baum and his branch of the family. Mark Weis, who I have exchanged information with for a long time. 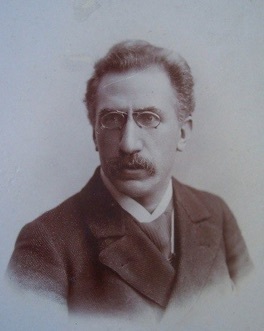 Wolfgang Fritzsche, who transcribed the Schierstein records. Gertrude Kornberg was very helpful in sharing her memories. Yaron Zakay provided information on the Blättner family and Michelle Emerson-Crawford provided information on the Liebmann family. A special thanks to Aunt Martha for the Baum family photo (shown above), one of the few Bar Mitzvah presents that I still find interesting 40 years later. The children’s clothing store of Siegfried and Moritz Baum is on the corner on the right.